Everyone knows New Year’s Eve is filled with drinks, fun and confetti, but why not ring in the new year by spicing things up a bit? With the Cash Cannon, you can do that and more! Most people wait until midnight for a balloon or confetti drop, but you can get the festivities going early by loading up the Cash Cannon and pulling the trigger. It’s a surefire way to get things turned up and get the party going. Traditional balloon drops and confetti poppers are can be lame, so why not celebrate by doing the unexpected? 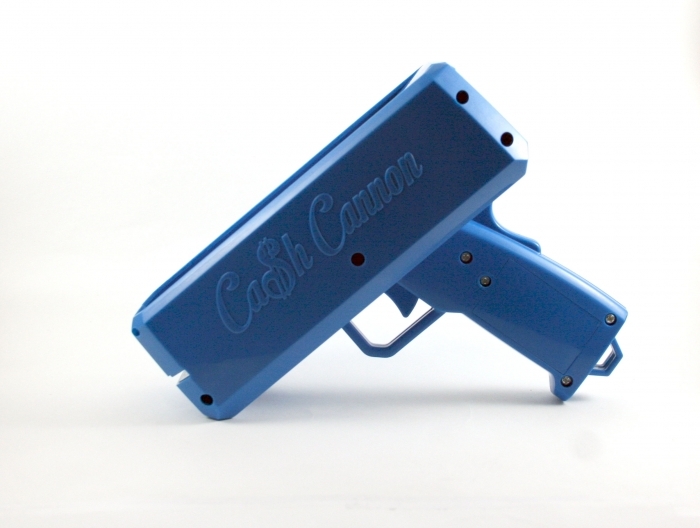 With the Cash Cannon gun, you can have a confetti shoot out that will never be simple or mundane. If you thought the Cash Cannon just pumped out dollar bills, you were mistaken. All that’s needed is dollar-sized paper in the color of your choice; load it into the Cash Cannon and shoot! It’s that easy. Simply keep reloading for continuous fun, helping everyone to create a party they’ll never forget. Looking fresh from head to toe? Well load the Cash Cannon with confetti to match your fit. Need confetti to match the theme of the party? For an all white party, use all white confetti. Or maybe you want to go against the grain and pick a completely different color paper that will make you stand out. All white party…red confetti. Do whatever you want! Make your own personalized party just by squeezing the trigger. There’s no limit to what you can do. If your really feeling it, grab a 100 stack of dollar bills from the bartender and load the Cannon up! Make sure all your friends have a Cash Cannon too. What’s the point of keeping all of the fun to yourself? The more Cannons…the better! The more paper flying, the more interesting it will be. You better believe you will never have a dull night out again. Plus, since the Cash Cannon is lightweight, it’s easy to carry around without weighing you down. 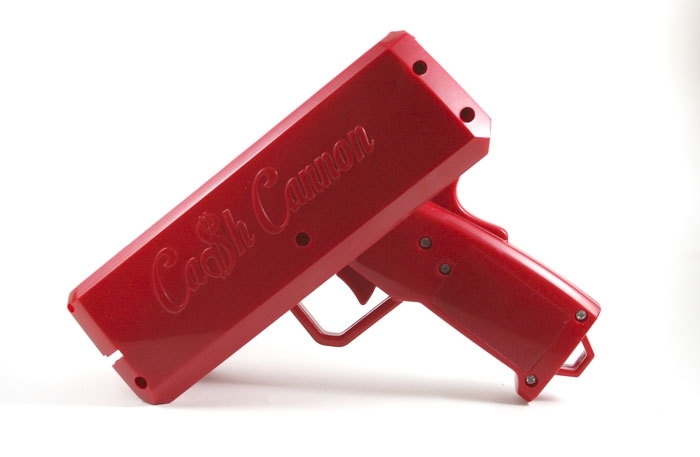 So this New Years, don’t just pop bottles… get it poppin’ with the Cash Cannon. But keep in mind, if you want to have a Cannon to shoot off for New Years, you need to order TODAY! Click here to place your order… let the fun begin! Word on the street is people are shooting off cannons… Cash Cannons! Want to be part of the action? 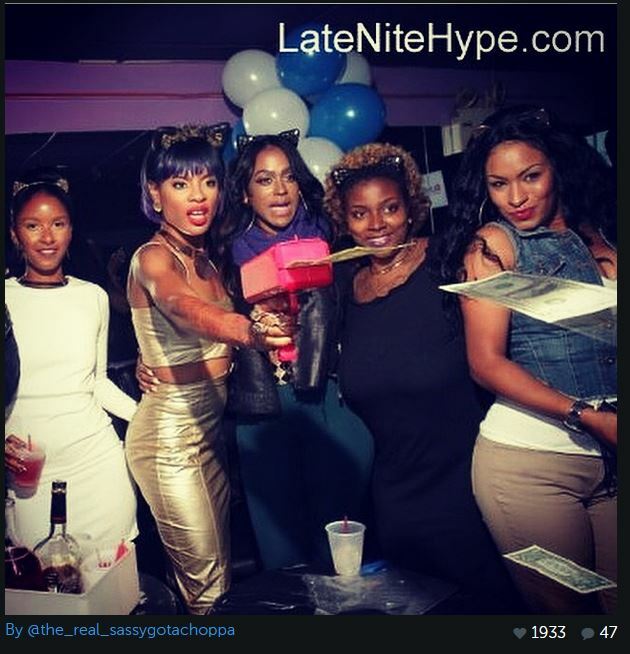 Ready to “make it rain” at the club or at your event? Haven’t heard of the Cash Cannon yet, but want to experience a new way of getting everybody turned up? Well listen up…Cash Cannon is for you! Anyone can enjoy the Cash Cannon gun. Simply load, squeeze and shoot! The best part is that you can control the flow of the action. Don’t want to release all of your cash, confetti or flyers at one time? Simply release the trigger and the flow will stop. Want to be able to move around the room and make it rain everywhere? No problem! Just press the trigger when you’re ready to shoot off again. When you run out, reload and voila! You’re ready to spray the club up again! 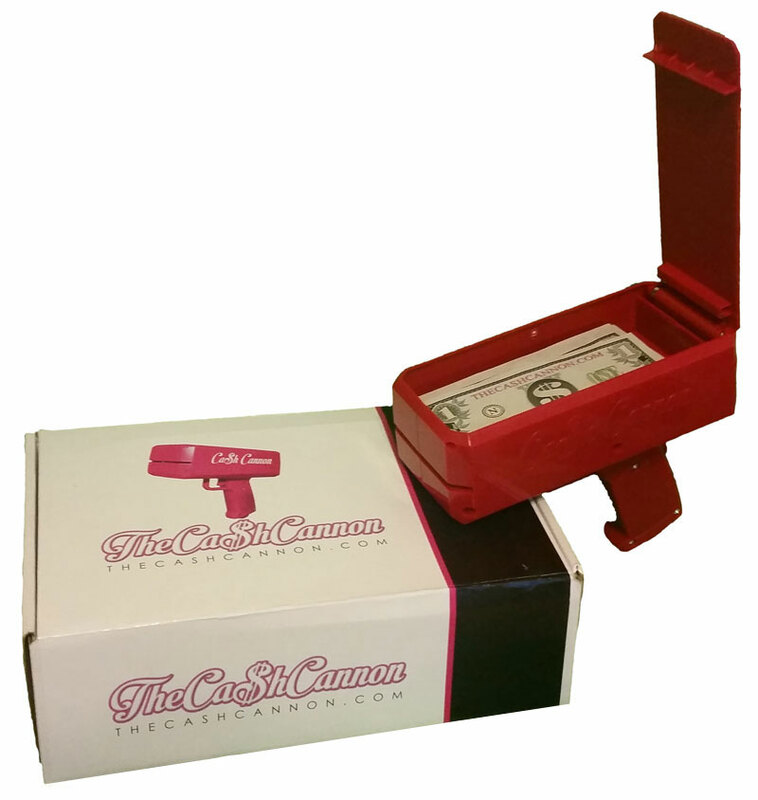 The Cash Cannon doesn’t have to be limited to club-use… you can use it anywhere! Take it with you everywhere you go and you’re guaranteed to be the life of the party. The options and versatility are endless. The Cash Cannon is drastically changing the party scene. Make sure you’re one of the first to impress your friends with this “rainmaker.” There’s no doubt that they’ll have so much fun, they’ll want one too! Buy it as a gift or for yourself, it’s sure not to disappoint. 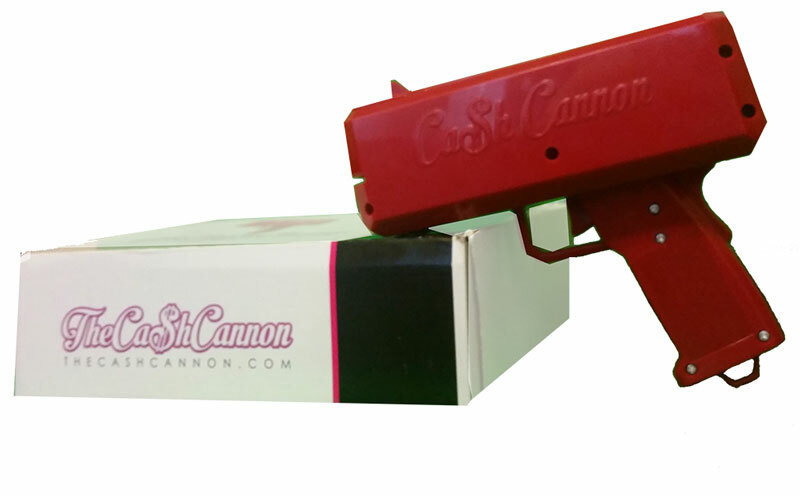 Purchase your Cash Cannon here! Fat Joe and Lil Wayne said Make it Rain!!!! You dont have to tell me twice. The Cash Cannon is here. Aimed to revolutionize the party scene. Use the cash cannon at any event. The first reaction is always a smile, followed by a….”Let me see that”. Next thing you know, its raining cash and confetti every where!!! Men love it, women love it even more…hint, hint…. THE CASH CANNON WILL LIVEN UP ANY EVENT! 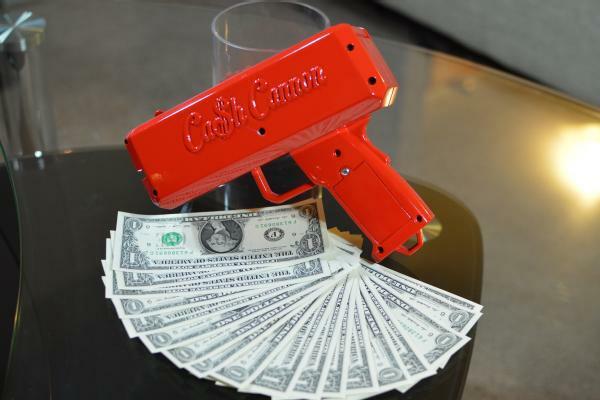 The Cash Cannon is the most unique novelty item on the market today. Guaranteed to get any event started, with loads of fun.